Below, we publish a column by Greek Prime Minister Alexis Tsipras, written for Le Monde, which includes the first list of concessions accepted by the Greek government in its negotiations with the troika (the European Commission, European Central Bank, and International Monetary Fund). Tsipras’s article is followed by a reply from Stathis Kouvelakis, a central figure in Syriza’s Left Platform. Both were translated by David Broder and first appeared on the Verso Books blog. On January 25 the Greek people took a courageous decision. They dared to challenge the memorandum’s one-way street of rigorous austerity, and demanded a new agreement. That is, a new agreement allowing Greece to get back on course to growth — within the eurozone, and with a viable economic program — while avoiding the errors of the past. The Greek people have paid a heavy price for these past mistakes. In five years, unemployment climbed to 28% (and to 60% among young people), while the mean income fell by 40%, as Greece became the European Union state with the highest index of social inequality, according to the Eurostat figures. Worse still, even despite the great damage that has been caused to Greece’s social fabric, this program has not succeeded in restoring its economy to competitiveness, while the public debt has swollen from 124 to 180% of GDP. Despite the great sacrifices of the Greek people, the country’s economy is still mired in the continual uncertainty engendered by the unrealizable goals of the doctrine of balanced budgets. This has trapped it in a vicious circle of austerity and recession. The Greek government’s main goal over the last four months has been to put an end to this vicious circle and this uncertainty. Now more than ever, what is needed is a mutually beneficial agreement to set realistic objectives for the budget surplus, at the same time as we reintroduce a program of development and investment: a definitive solution to the Greek situation. Moreover, such an accord would mark the end of the European economic crisis that broke out seven years ago, putting an end to the eurozone’s cycle of uncertainty. Today Europe has the capacity to make the decisions that will produce a strong recovery in the Greek and European economy, putting an end to any prospect of a “Grexit.” Such a prospect is a barrier to the long-term stabilization of the European economy, and is liable to undermine citizens’ and investors’ confidence in our joint currency at any moment. Yet some people say that Greece is doing nothing to help make progress in this direction, because it arrives at the negotiations with an intransigent attitude, and without offering any proposals. But is that really the case? Given that the moment we are living through is of critical or even historic importance for both Greece’s and Europe’s future, I would like to set the record straight, giving both European and world public opinion a responsible picture of the real intentions and positions of the Greek government. After the Eurogroup’s February 20 decision, our government submitted a number of proposed reforms, seeking an agreement that would combine respect for both the verdict of the Greek people and the rules that govern the functioning of the eurozone. In particular, we agreed to smaller primary surpluses [the budget surplus before interest payments] for 2015 and 2016 and higher ones for the subsequent years, with the expectation that they will rise in correspondence with the rate that the Greek economy grows. Another important proposal was our commitment to raise public revenue by shifting the burden from low- and middle-income citizens to those who have higher incomes and, up till now, have failed to pay their share in dealing with the crisis, protected as they have been both by my own country’s political elite and by the troika, which closed its eyes to this. Moreover, from its first day in office the new government has demonstrated its intentions and its determination by introducing a legislative measure to confront fraudulent triangular transactions, intensifying customs and fiscal controls in order to suppress smuggling and tax evasion. Simultaneously, for the first time in many years the Greek state has charged the media owners for their debts. The changed climate in the country is obvious. It is also proven by the fact that the courts have accelerated the processing of cases, so judgments on matters concerning tax evasion come through in a shorter time frame. The oligarchs who were accustomed to being protected by the political system have good reason lose sleep over this. During the discussions with the institutions we not only set out our general line of march, but also made specific proposals. We have thus bridged a large part of the distance that separated us a few months ago. More specifically, the Greek side has agreed to embark on a series of institutional reforms, such as the strengthening of the independence of the Greek Statistics Agency (Elstat); interventions designed to speed up the administration of justice; as well as interventions in the markets in order to eliminate privileges and distortion. Moreover, though we are diametrically opposed to the model of privatizations that the institutions advocate — which does not offer any prospect of development, and does not effect any sort of transfer of resources to the real economy, but only goes toward paying off debt, which is by no means viable — we have agreed to pursue the privatizations program with a few small modifications, thus demonstrating our intention of drawing toward a rapprochement. We also arrived at an agreement on mounting a major reform of VAT, simplifying the system and strengthening its redistributive element, with the aim of raising both the collection rate and the overall revenue. We made concrete proposals for further measures to increase tax receipts (an exceptional charge on very high profits, a tax on online gambling, intensified controls on the big fraudulent depositors, measures to recover overdue payments to the state, a special tax on luxury goods, a tendering process for radio and TV licenses) — the kind of measures the troika seem to have forgotten about, as if by accident, for the last five years and more. These measures are aimed at increasing the state’s revenues at the same time as avoiding adding to the recession, since they do not weaken effective demand and do not impose any further burden on those on low and middle incomes. We reached an agreement on implementing a major reform of the social security system, with the merger of the social insurance funds and the suppression of measures allowing the unjustified granting of early retirement, and thus increasing the real retirement age. We have to take account of the fact that the social insurance schemes’ losses, which raised question marks over their medium-term viability, are principally because of political choices. The responsibility for this lies with both the previous Greek governments and, above all, the troika (the €25 billion reduction of their reserve funds thanks to “private sector involvement” in 2012, and above all the very high unemployment rate, which owes almost exclusively to the extreme austerity program applied in Greece since 2010). Finally, despite our commitment to immediately reestablish European labor norms — these having been completely pulled apart over the last five years, under the pretext of competitiveness — we agreed to implement a reform of the labor market, after consulting and securing the agreement of the International Labour Office. Taking all the above into account, we might rightly ask why the representatives of the institutions persist in saying that Greece has not presented any positive proposals. Why continue to refuse to provide liquidity to the Greek economy, when Greece has demonstrated that it does want to respect its external obligations, paying more than €17 billion in principal and interest since August 2014 (around 10% of its GDP) without outside funding? Finally, what is the agenda of the people who make leaks to the press saying that we are far from reaching an agreement, when such an accord would allow an end to the political and economic uncertainty that is today felt at both a European and world level, and which the Greek question has only aggravated? The unofficial answer that you get from some people is that we are not close to an agreement because the Greek side has dug into its positions of reestablishing collective bargaining and refusing to cut pensions further. I ought to provide some explanation on these points: as for the first of them, Greece’s position is that its labor legislation ought to correspond to European norms, and it cannot flagrantly violate European legislation. We are asking for nothing more than what is already the norm in the eurozone countries. We made a statement to this end together with European Commission President Jean-Claude Juncker. As for the second point, concerning pensions, the Greek position has a logical position based on sound reasoning. The cumulative reduction of pensions in Greece in the memorandum period ranges between 20 and 48%: today 44.5% of retired people receive a pension below the relative poverty line, and according to Eurostat 23.1% of them live in risk of poverty and social exclusion. This situation, which is a result of the memorandum policy, is intolerable in Greece just as it would be for any civilized country. So we have to tell it like it is: if we have not yet reached an agreement with our partners, it is not because of our intransigence or because our positions are incomprehensible. Rather, the cause is certain institutional representatives’ obsessive insistence on unreasonable solutions, demonstrating their indifference toward the democratic outcome of the recent Greek parliamentary elections as well as toward the positions of the European and international institutions, who have stated that they are ready to show some flexibility out of respect for the verdict at the ballot box. Why this obsession? An easy explanation would be to say that it expresses certain institutional representatives’ interest in covering up the failure of their own program, securing a sort of confirmation of it. Indeed, we should not forget that a few years ago the IMF publicly recognized that it had failed to foresee the devastating effects that the multiple budget cuts imposed on Greece would produce. I do not think that this is a sufficient explanation. I don’t believe that Europe’s fate can hang on the obsessions of a few individual actors. I have reached the conclusion that the Greek question does not concern Greece alone, but is at the center of a conflict between two opposed strategies for the future of European integration. The first seeks the deepening of European integration, in a context of equality and solidarity among its peoples and citizens. Those who support this strategy start out from the fact that it is unacceptable to force the new Greek government to apply the same policies as the previous administrations did — which, moreover, totally failed. Otherwise we would have to do without elections in any country subject to an austerity program, and accept the European and international institutions imposing prime ministers and governments and depriving the citizens of their right to vote until the program is complete. This would amount to the abolition of democracy in Europe and the beginning of an intolerable split in the EU. Ultimately, all this would result in the birth of a technocratic monster and Europe abandoning the values on which it was founded. The second strategy would lead to a rupture and the division of the eurozone, and thus of the EU. The first step in this direction would be the formation of a two-speed eurozone, with the central core imposing the harsh rule of austerity and structural adjustment. This central core would also impose a super minister of finance for the eurozone, who would enjoy immense power, with the right to reject national budgets — of sovereign states — who failed to conform to the doctrines of extreme neoliberalism. There would be a simple solution for all the countries who refused to give into this power, namely severe punishment: the compulsory imposition of austerity, and, added to that, restrictions on the movement of capital, disciplinary sanctions, fines and even the creation of a currency parallel to the euro. That is how the new European power is trying to establish itself, and Greece is its first victim. It is already being presented as the bad example that the other disobedient states and peoples of Europe must not follow. But the fundamental problem is that this second strategy carries great risks, and those who are promoting it seem not to realize this. This second strategy risks becoming the beginning of the end for the eurozone currency union, transforming it into a simple exchange rate zone. But, moreover, it opens up a process of political and economic uncertainty that could also upset the balance across the whole Western world, from top to bottom. Today, Europe is at the crossroads. After the Greek government’s major concessions, the decision no longer rests in the hands of the institutions — which, with the exception of the European Commission, are unelected and unaccountable to the people — but in the hands of Europe’s leaders. Which strategy will win out? The Europe of solidarity, equality, and democracy, or the Europe of rupture and ultimately division? If some think, or want us to believe, that this question concerns Greece alone, they are very much mistaken. I can only refer them to Ernest Hemingway’s great work, For Whom the Bell Tolls. 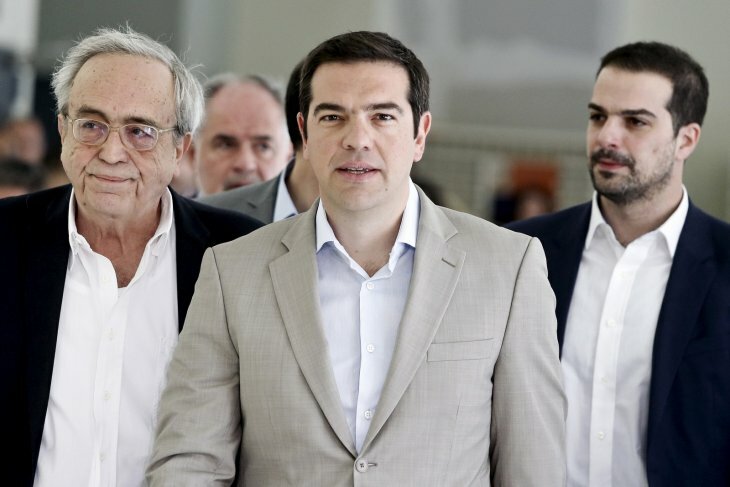 Stathis Kouvelakis: Syriza Inside the “Iron Cage”?